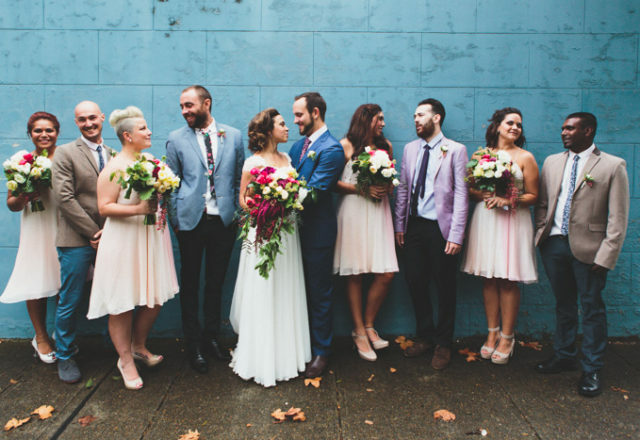 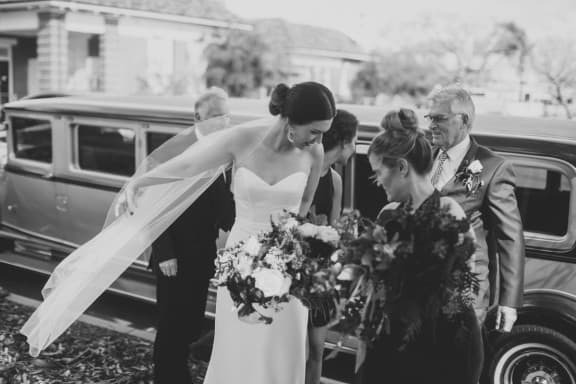 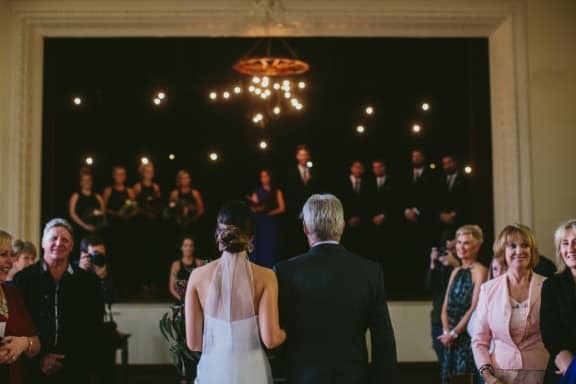 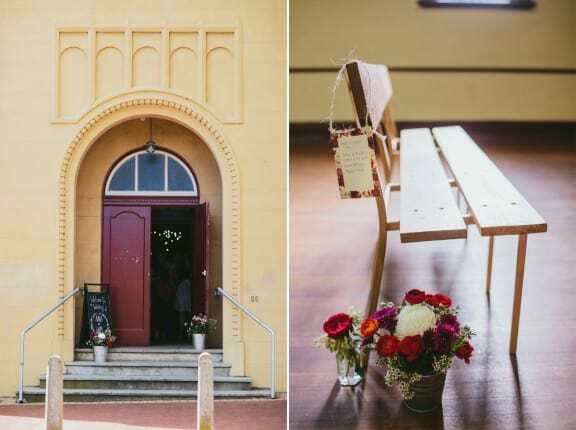 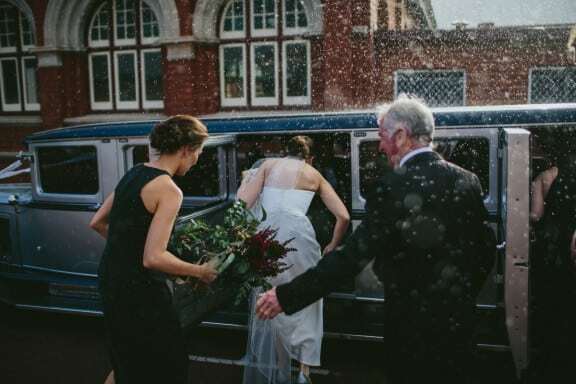 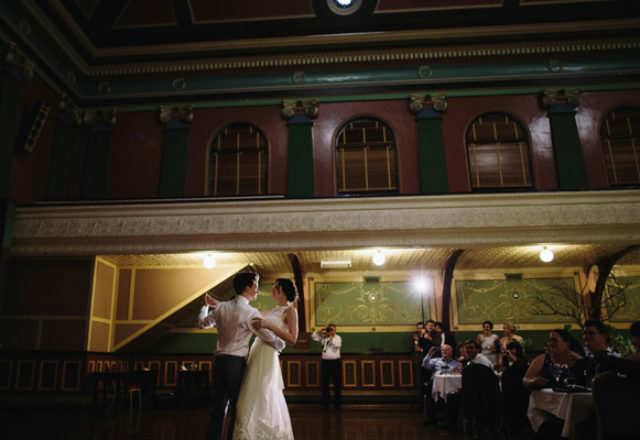 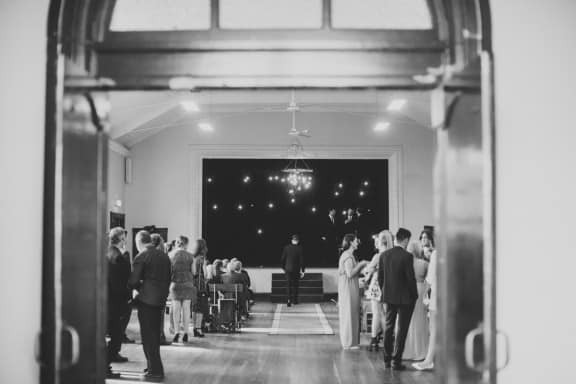 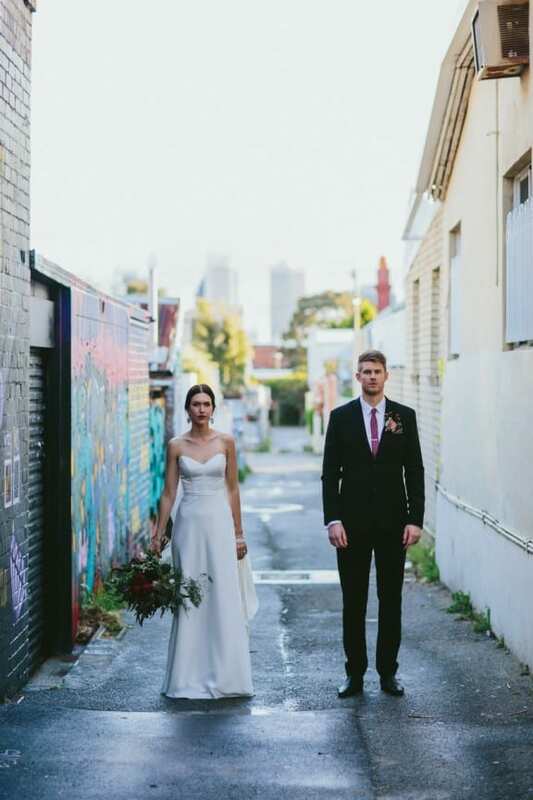 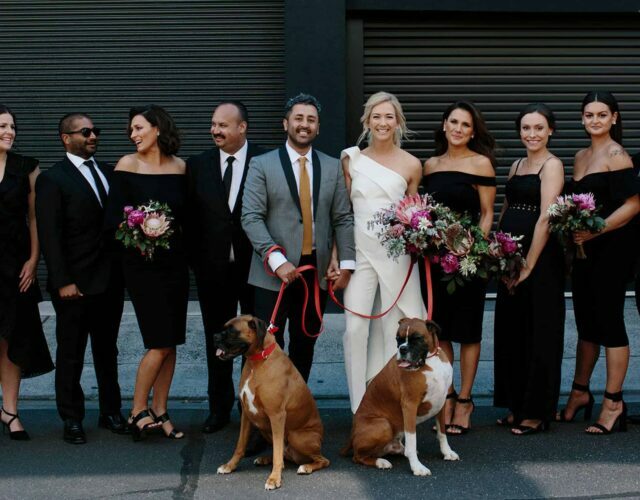 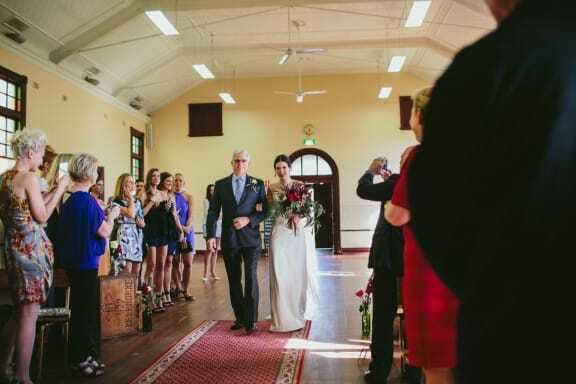 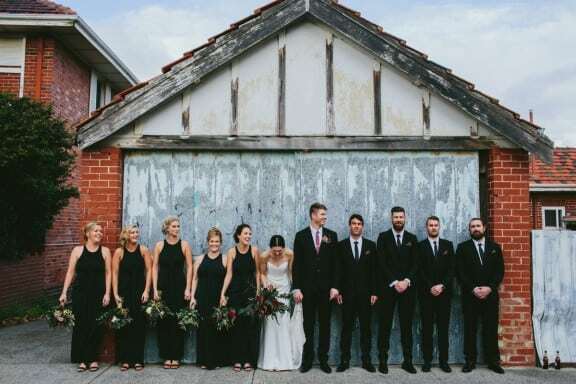 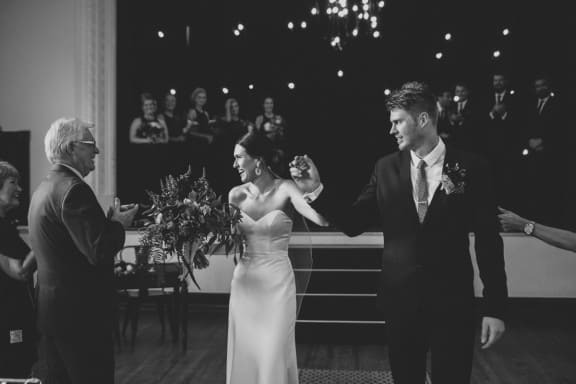 Lani and Cam were quite literally centre stage when they tied the knot at North Perth Town Hall. 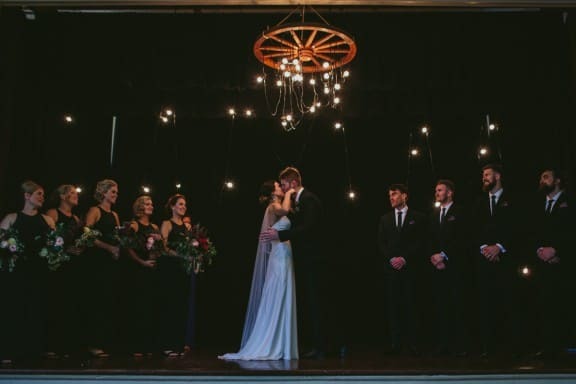 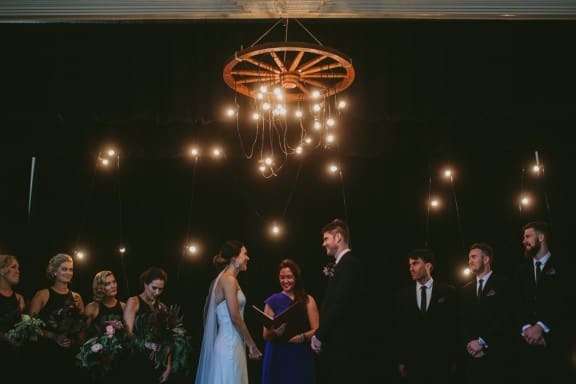 With a festoon of exposed light bulbs as backdrop, this starry-eyed couple chose their sixth year anniversary to get hitched. 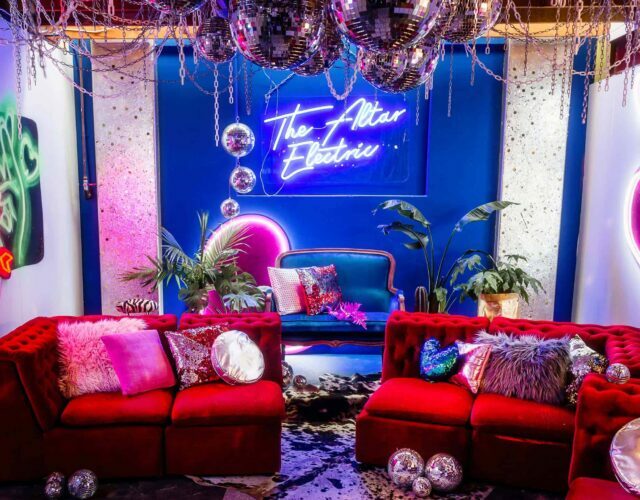 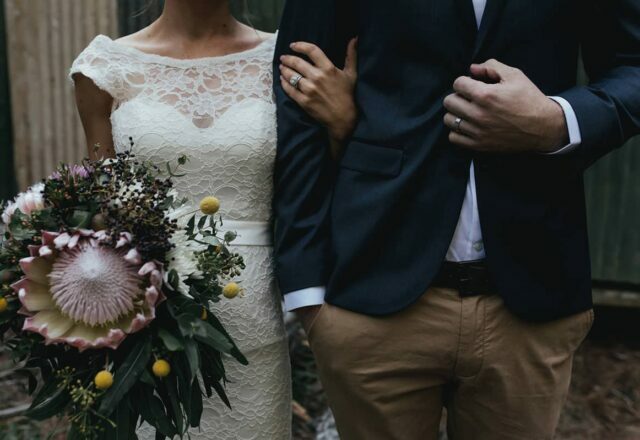 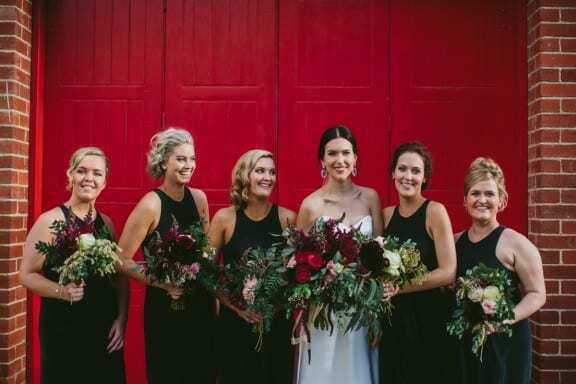 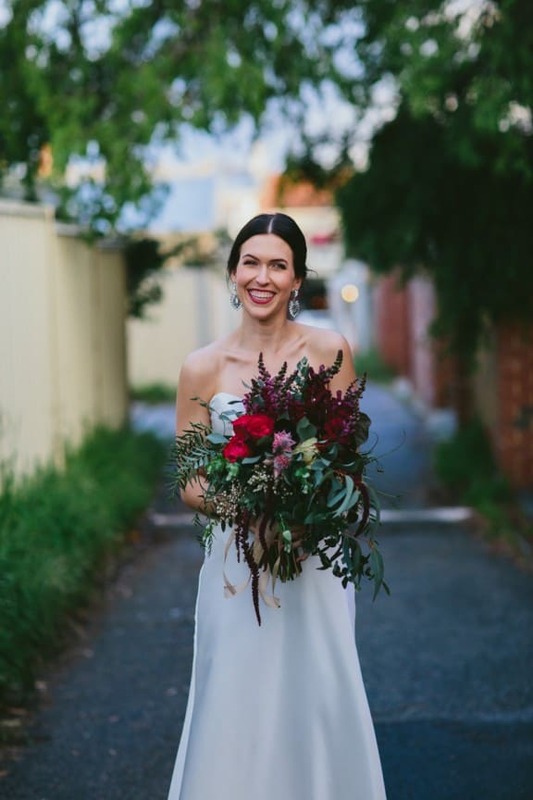 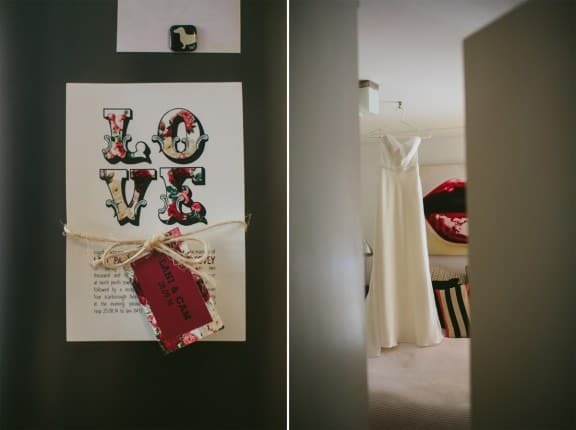 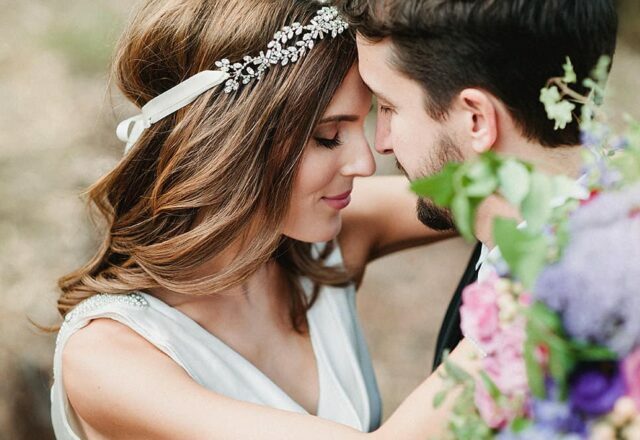 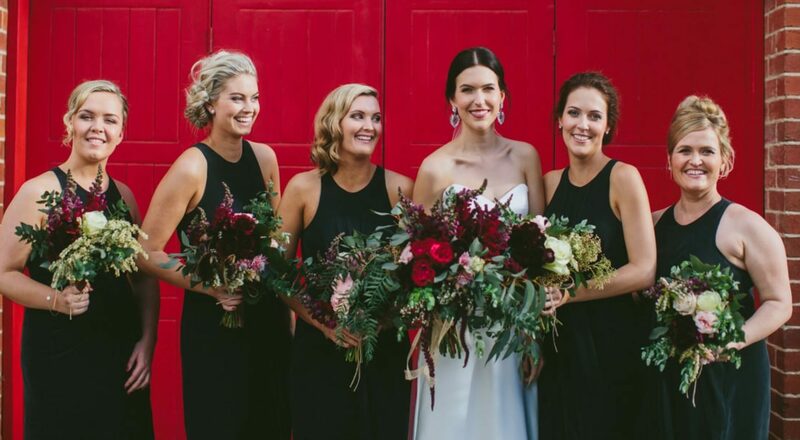 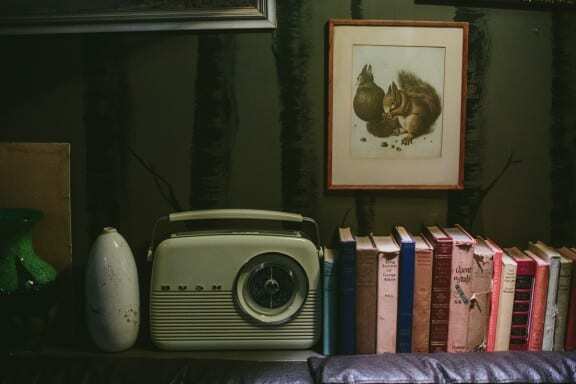 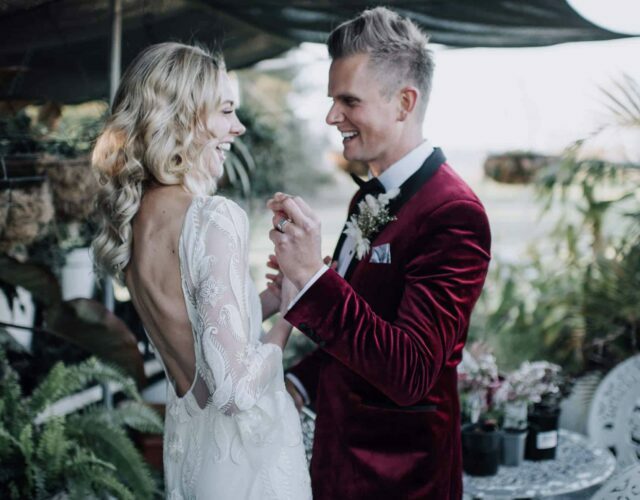 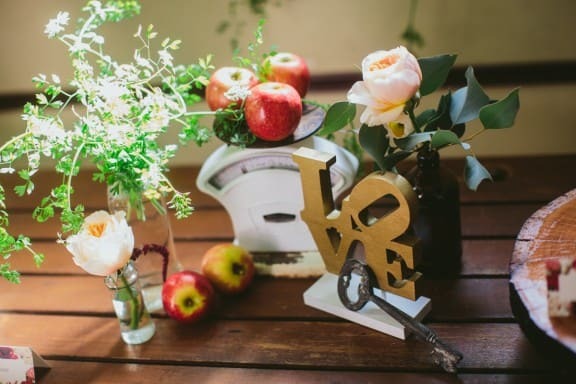 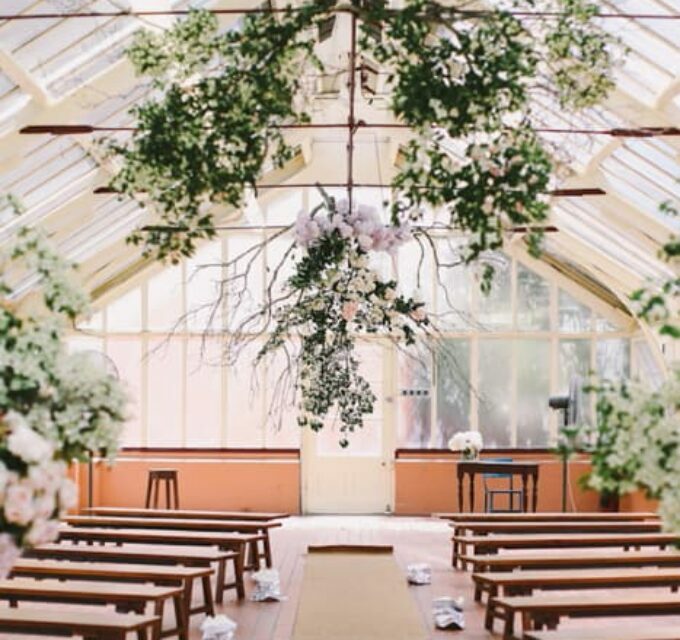 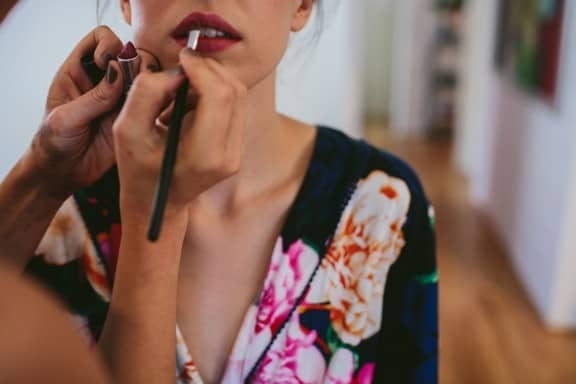 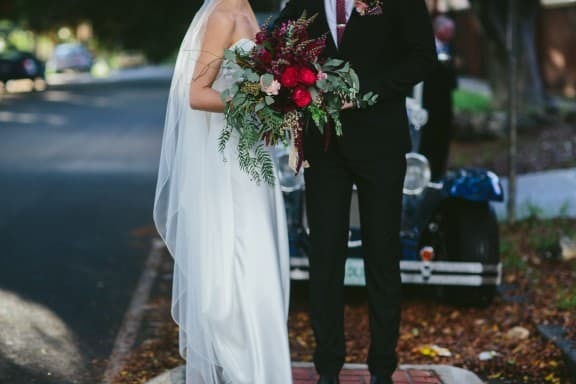 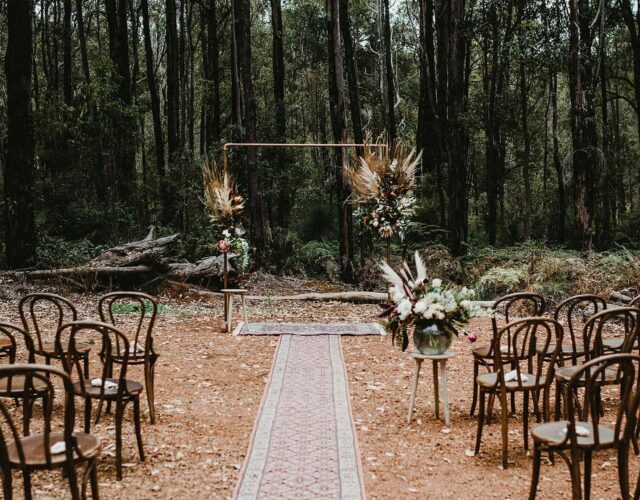 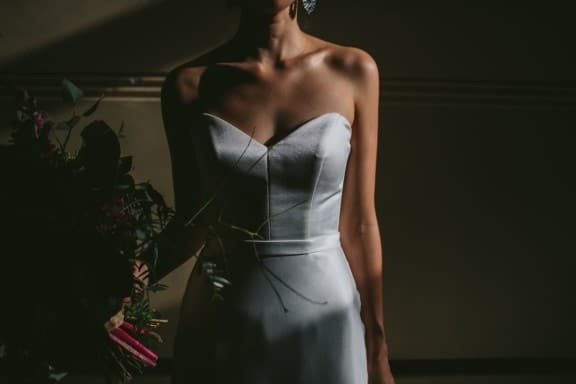 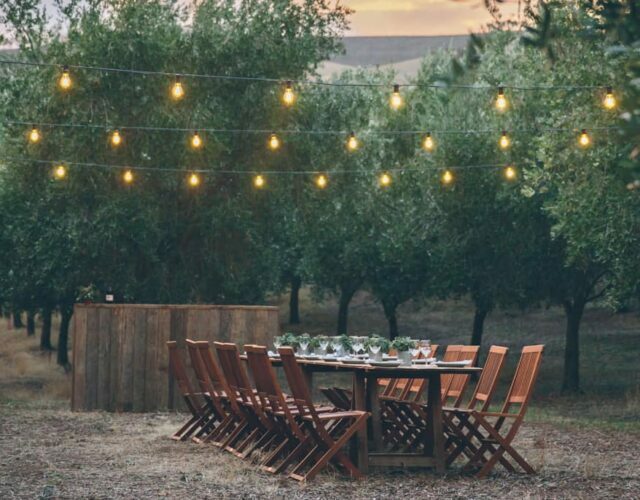 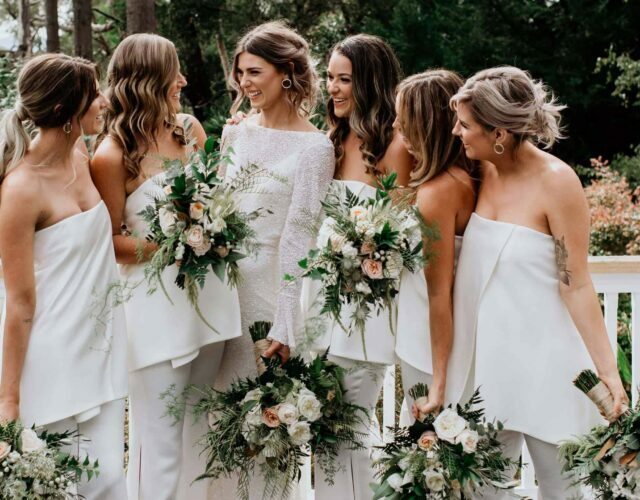 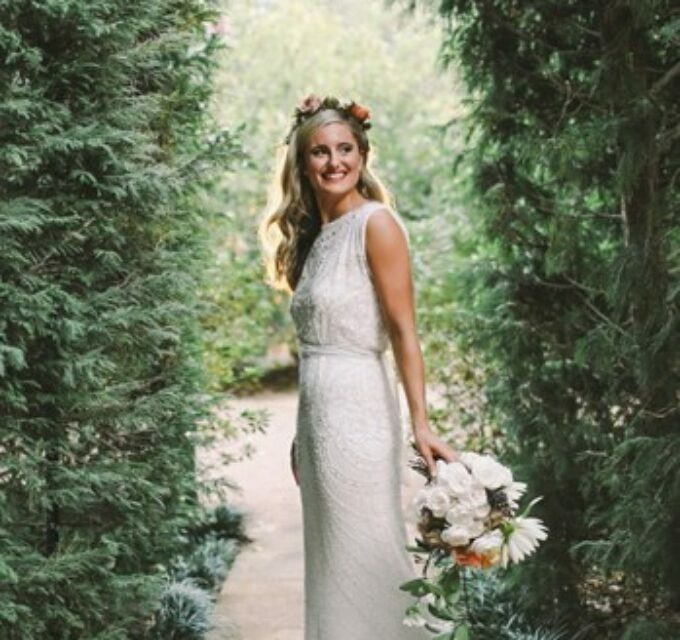 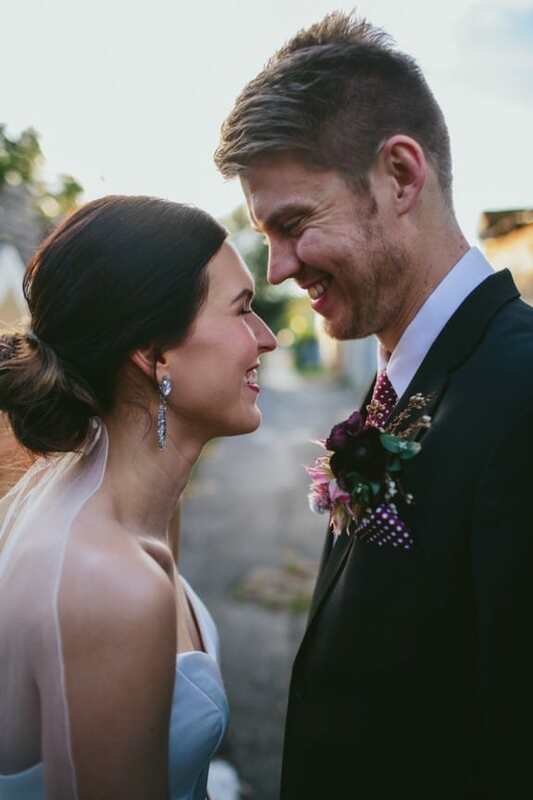 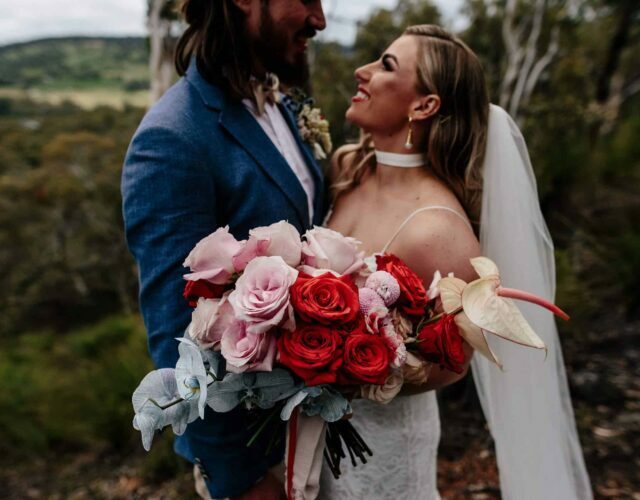 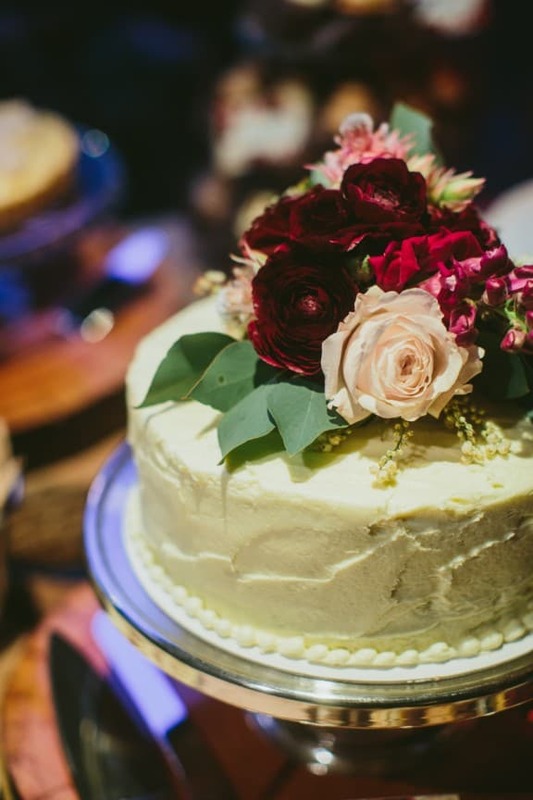 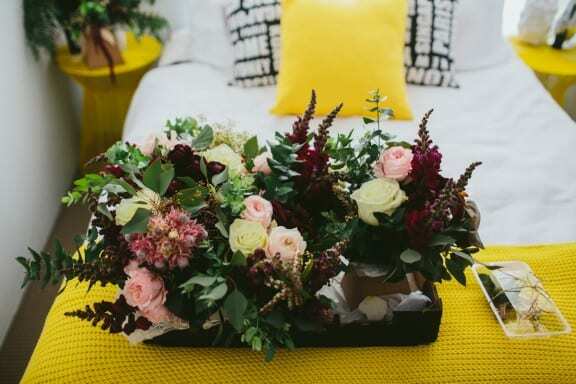 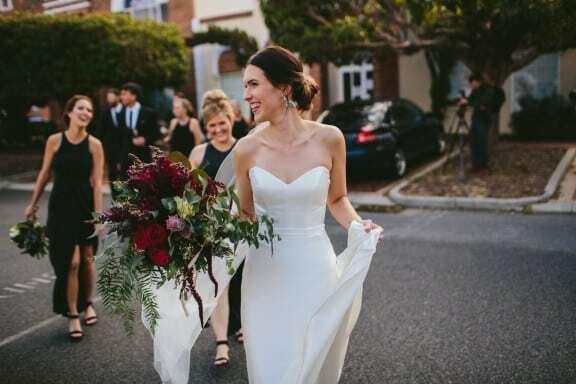 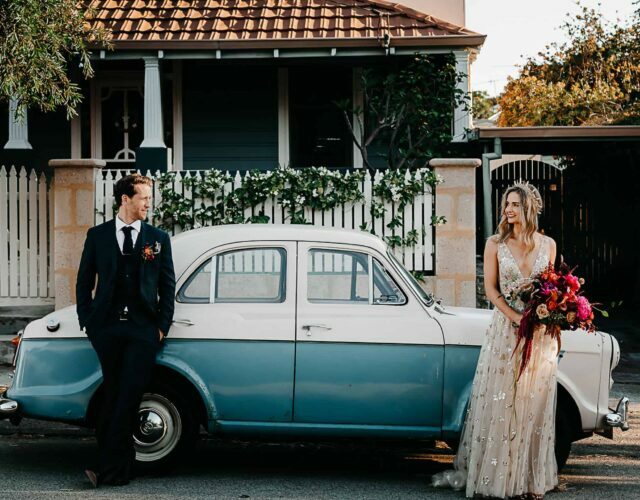 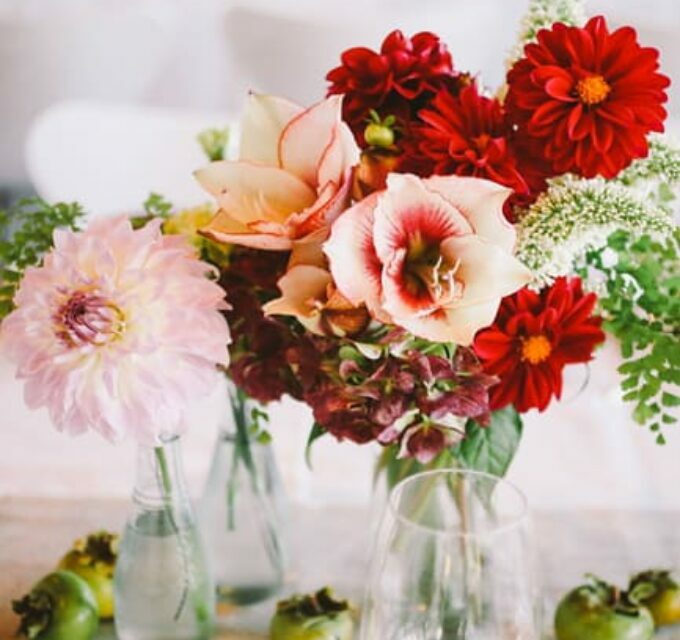 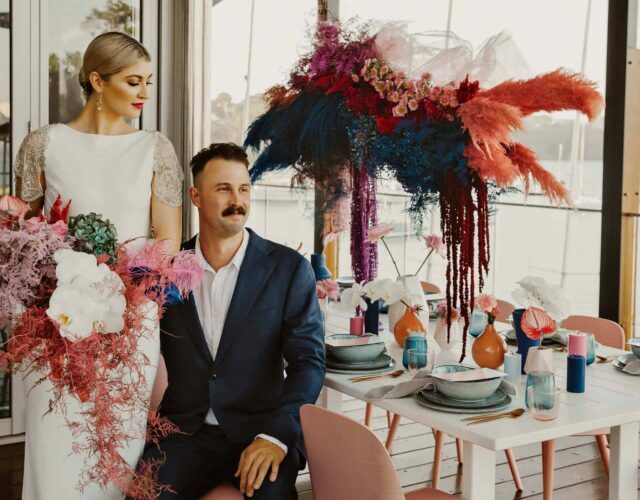 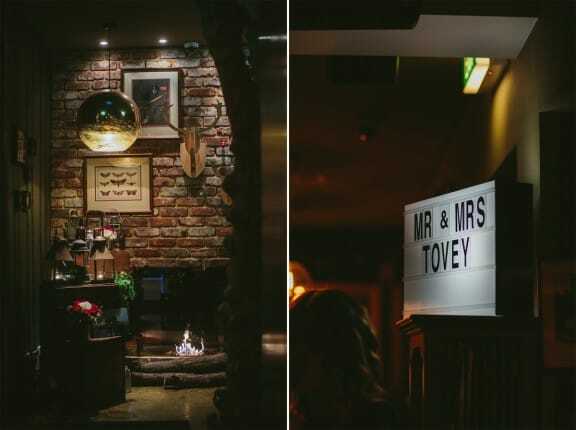 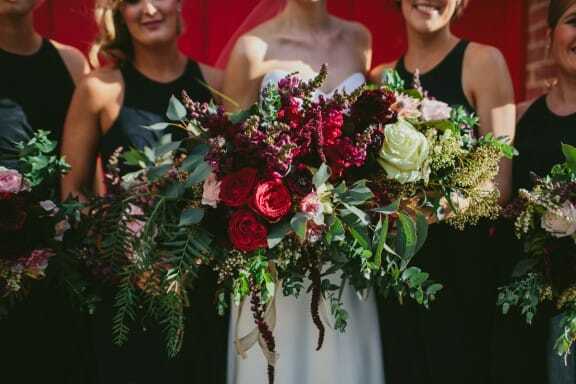 Styled by Maisey Collections, raw wooden textures and luscious berry-toned blooms courtesy of Lime Flowers gave the day a rustic feel, captured by Still Love and La Lune Cinema. 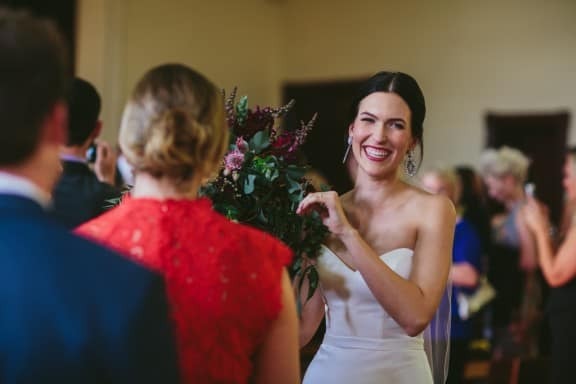 For some, a five-week European adventure might have been an ideal time to pop the question, but that’s not how Cam rolls. 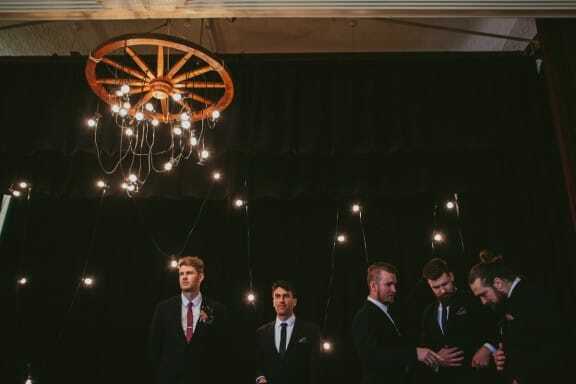 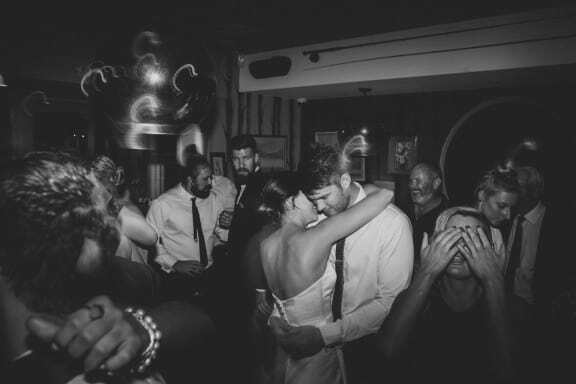 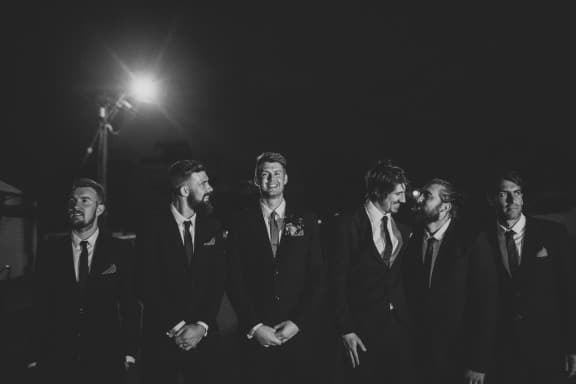 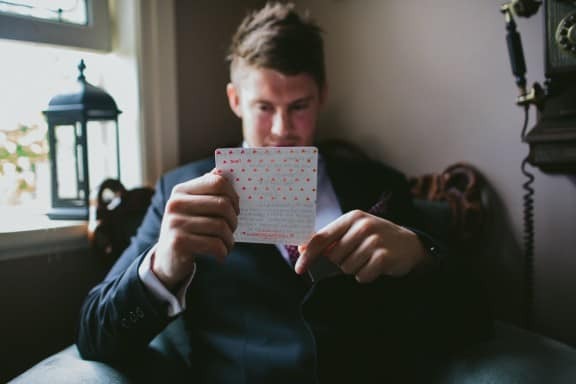 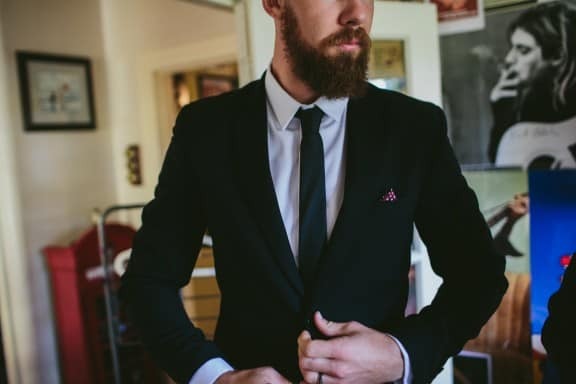 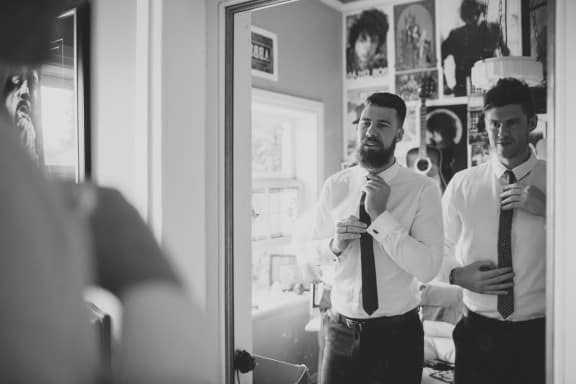 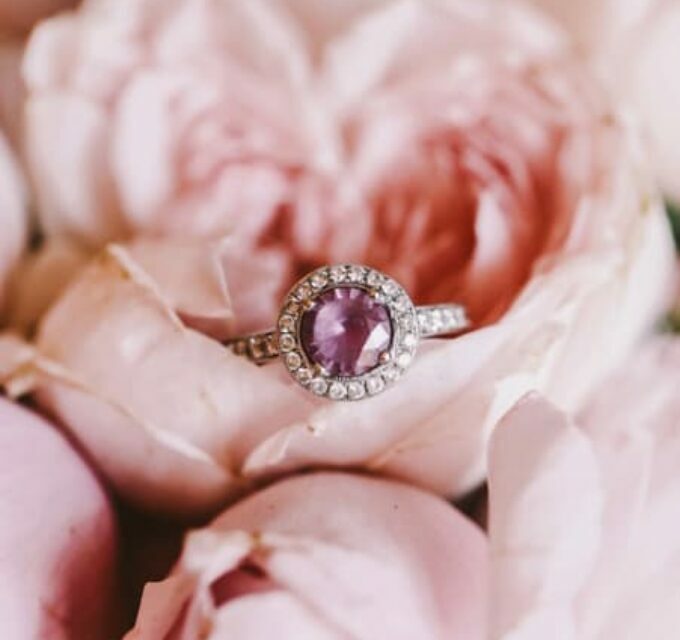 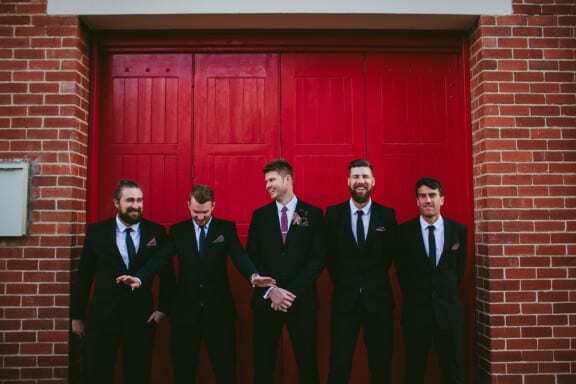 This cheeky groom opted for the unexpected, getting down on one knee on a regular Tuesday night at home. 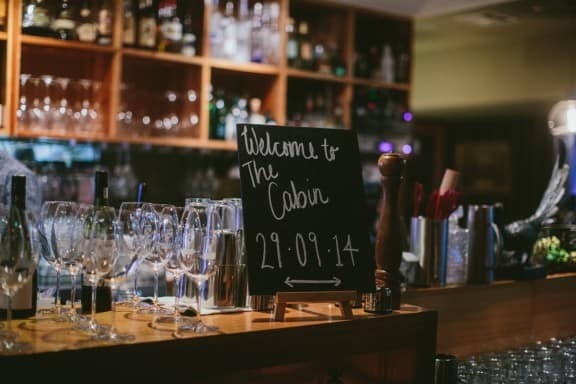 Afterwards, these cool kids kicked back at the Cabin Small Bar for dinner and the Cabin’s cosy ambience ended up being the perfect spot for the reception too. 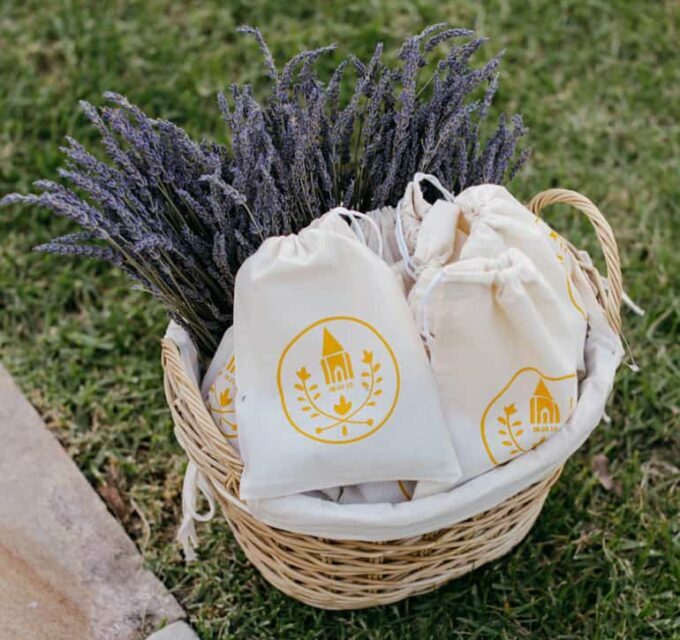 While the Cabin took care of the catering, a mother’s touch never goes astray. 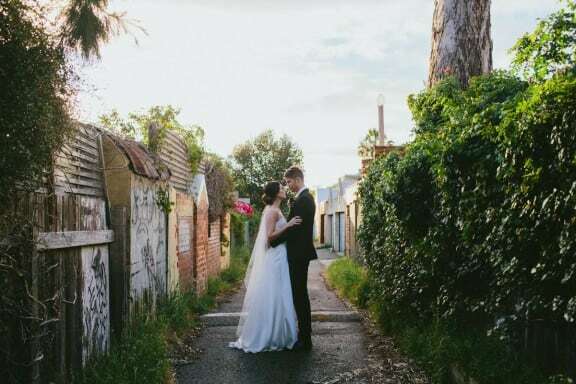 Both Lani’s mum and Cam’s step-mum took to the kitchen to prepare the newlyweds fave desserts – lemon meringue pie for Cam and special pecan pie for Lani. 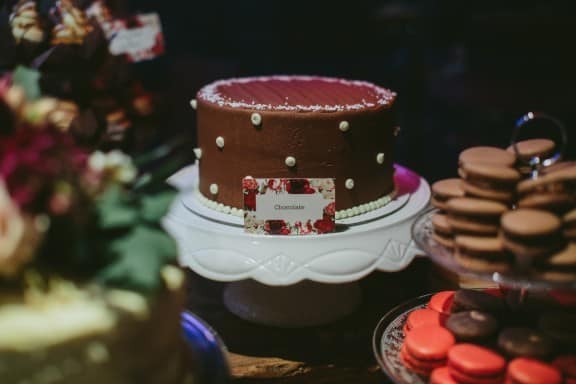 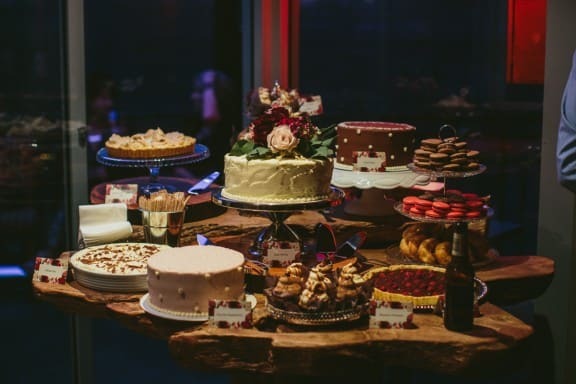 Our mouths are watering just looking at the decadent dessert table! 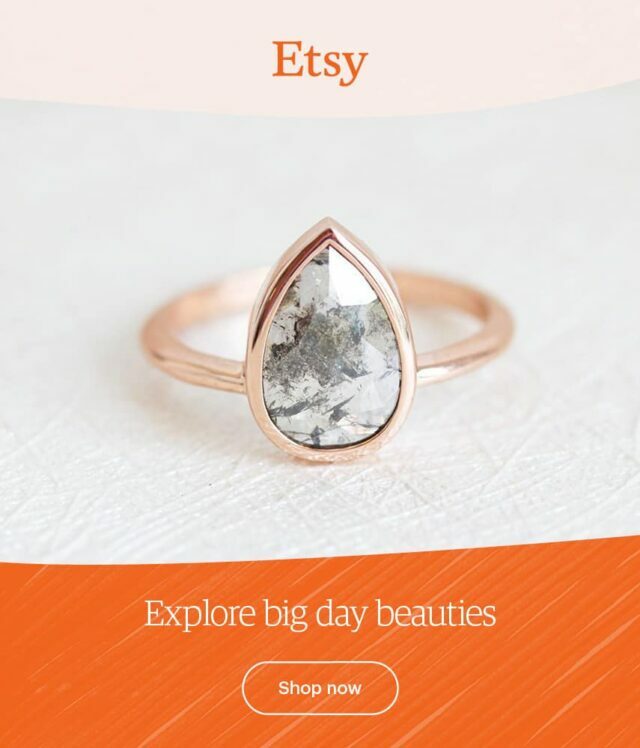 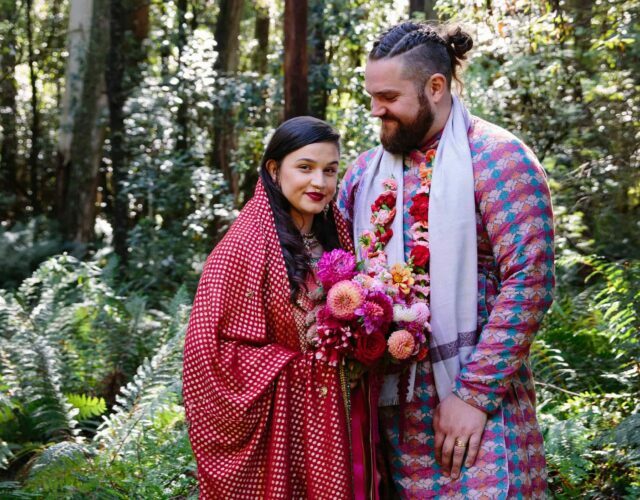 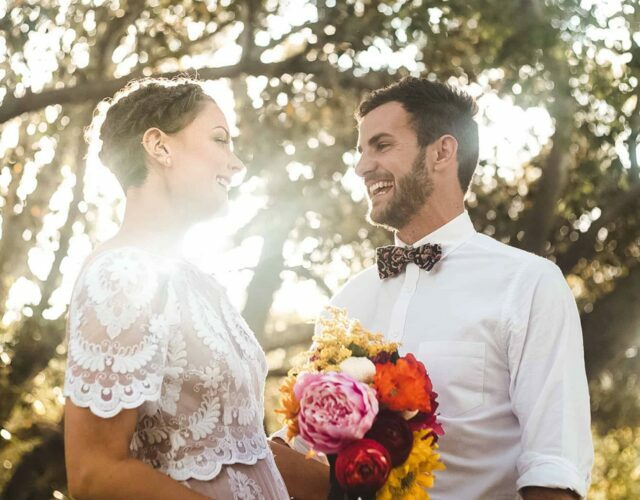 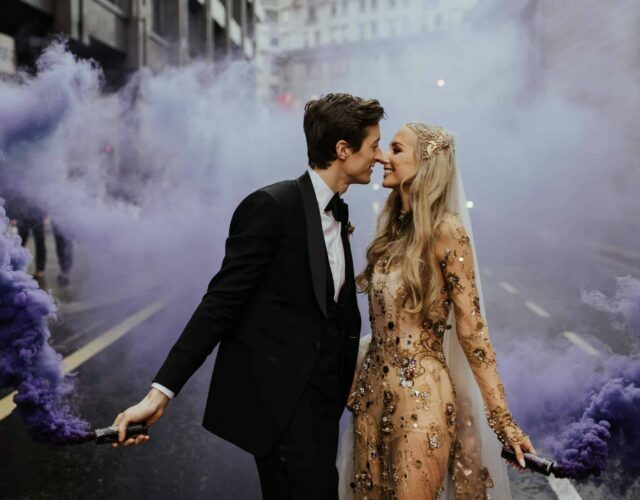 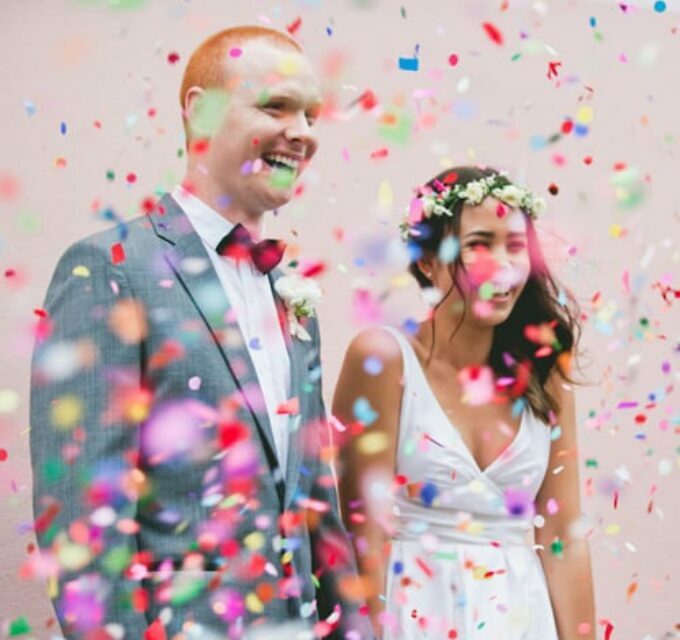 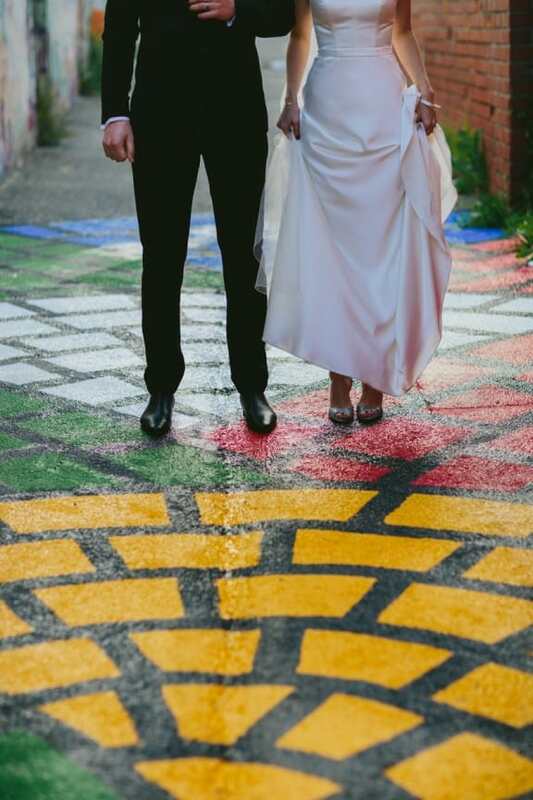 Wanting their wedding to be a reflection of two of them, Lani and Cam DIY’ed day and night in the lead up. 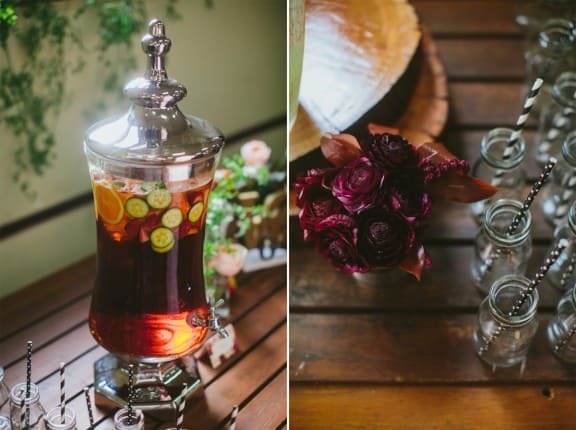 Lani, her mum and a graphic-designer friend collaborated on the invitations and guests took home recycled-jars filled with all kinds of deliciousness.